September, the harvesting of the grapes. Les Très Riches Heures du duc de Berry. The Musée Condé, Chantilly. 1410. Les Très Riches Heures (The very rich hours of the Duke of Berry) is a book of hours commissioned by Jean France Duc de Berry around 1410. Over a century in the making, the book has more than 400 pages and features 131 large scale illustrations. It is possibly the single most valuable book in the world and is considered the most important illuminated manuscript of the 15th Century, earning the distinction "le roi des manuscrits enluminés" (the king of illuminated manuscripts). Artists associated with the creation of this manuscript include the Limbourg brothers (Netherlands), Barthélemy van Eyck (Netherlands), and Jean Colombe (France). 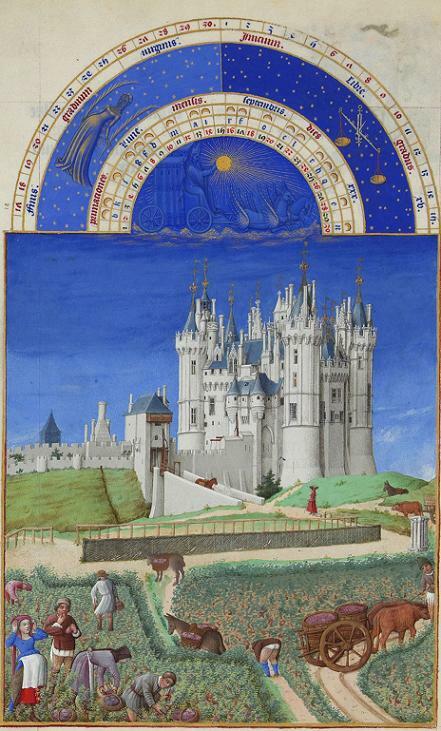 In 1416, while this masterpiece was in process, the Duke and the Limbourg brothers all succumbed to the plague. This manuscript is part of the collection of The Musée Condé in Chantilly, France.